Happy New Year 2011! and Yes, I am back. (no)Thanks to the ever crazy gov, I got extra holiday here today, so I can read and write something for year 2011. So here is a video to cheer you up for 2011. Sorry, I have to time off from writing to this blog, so that I can take care my daughters. Enjoy the Christmas video performed by North Point's iBand using iPad (mostly) and iPhone. Table Connect for iPhone - extended screen for iPhone? Anyway, I went to their blog recently and look at their youtube video. It is basically an extended screen for iPhone(? ), they even demo playing a game on it on send video. I have been using Maxthon 2 for a few years already, but this is not my primary web browser. My primary web browser for now is FireFox and Safari. Maxthon has some nice features which attracted over 536 million downloads! The website seems to be have bugs, I can't open www.genec.eu web pages directly. OMG! I am out of idea of what to write! Also there is not much things happen on the web, well, PayPal is not friend with Wikileak anymore. But the rest of news just way too boring. So I will be boring too this week. Be boring with my series of freeware for WinMo for rest of the week. Who still use WinMo phone these day? Also google rejected my adsense application again! PSP lovers, prepare to merge your PSP with smartphone! See the video after the jump. Sources said that NVIDIA going to have quad-core Tegra processors for smartphone. Okay, the sources is NVIDIA itself this time. So what you want to do with quad-core? What's wrong with this guy? Why Can't We Walk Straight? Google going into music business? HAHA. Actually it is someone found it out on Google Translate. Google Chrome 8 is out! hey people, Google Chrome now is 8! Hi iPhone/iPad/iPod users, Do you want to buy an one thousand dolar (that is US dolar) apps?!?! MorseUtil is an application to translate texts to Morse code. 99.99% people of the world don't know Morse code, because of Internet, but this is a very good secret language that you want to have with your friends. Or simply an emergency code that you want to communicate with the world during emergency. If you like pizza and like to make pizza on your own, then you can try this apps on your Windows Mobile phone. It has recipe of various pizza and support multiple language. I was still having problem with Windows 7's bug that the icons on desktop will running around when I switch from single monitor to extended monitor and vice versa. After googling around, it is a known bug that Microsoft yet to fix it. Even tried out various method (like unchecked "align icons to grid") that people suggested, the icons still running around. UNICEF has started a nationwide movement called "Get on Board" to provide the public with the information, insight and resources to stop child abuse. This knowledge will empower everyone to protect the children in our families and communities. Let us show our children that at least a 100,000 of us care. The more people who raise their hand to be counted, the stronger the campaign becomes to deter an abuser from hurting a child. * Blog about the campaign. * Donate your Facebook status message or change your profile picture to the picture of your designed hand. * Create conversations on Twitter. * Send a letter to the Editor of your daily newspaper. * Organise a sign-up at your company, college, place of worship. How much to play MMO game? This Chinese was playing a MMO game on Asia's largest LED screen (250m long/30m wide) which locate at Beijing, for 10 minutes. He paid $15,000 for that! OMG! Yes, don't make GOD angry, else HE will punish you, like remove you from facebook, and banned you forever from facebook. Finish up your homework before you are allow to play your WII/XBox/PS(1/2/3)/PSP/blah blah blah! Sounds familiar? It is more for Asian, less for Western world, but playing too much video games can be exhausted, waste time and harmful to your social ability and now it is harmful physically, yes! While some have abandoned Windows Mobile (skyfire for example), some good people at WinMo community (XDA for the best example) still developing useful apps for Windows Mobile platform. I have posted many freeware PPC in this blog, check they out here. Dr. West, an Afrotech Forum user, made himself a computer touchpad from a piece of paper with graphite on it. Yup, it is official! Skyfire is officially dumps WinMo and Symbian. Feliks Zemdegs, Melbourne Cube Day, Nov 13 2010. No machine can be that fast right? Okay, RockMelt finally working on my laptop. See what I complained about. Anyway, here is my print screen. The icons (apps) on both side are finally appear.It could be previously it cannot login. So your friends are on left hand side; facebook profile/twitter/RSS on right have side. I can invite friends to RockMelt, but only gave me 3 invites? WHY WHY WHY? Another problem is I cannot invite some people, most of my friends can be invited, but not all, not sure why yet. My twitter also added here, so a single click can see my twits. Verdict, if you use Facebook 24/7, this could be your browser. Else look for FireFox or Safari (I use both of them). Still under development, but it should be the best apps! Skyfire has abandoned WinMo, the community is angry but Skyfire management is not doing anything about it. What is Skyfire you might ask? Skyfire is powerful web browser for smartphone that support flash, mainly for WinMo and symbian. However recent Skyfire moved to apple apps store. Since then WinMo and Symbian users have problem accessing Skyfire. Web browsing using Skyfire was nice because the browser works with the company server to optimize the web content you surfing, but now not anymore for WinMo and Symbian. Mouse (not the Mickey Mouse or the real mouse) is one great invention for PC/Mac, but will it still around when everything is touch screen? Anyway, some of the feature in Windows 7 can be access with a few key strokes compare to clicking with mouse (click and click and click and click and click and click!). Some the the keyboard shortcuts showed below already have exist on older Windows, but here you go, enjoy! Missed the sticky notes in your study table or cubicle? Now you can have it on your Windows Mobile phone. Windows 7 also have this feature and since it is build in on Windows 7, so it is free. Now, back to Top Notes. This apps will put the sticky note on top of the "Today" screen. Okay, Paul is death, but its' left behind some legacy, if you still remember World Cup 2010. 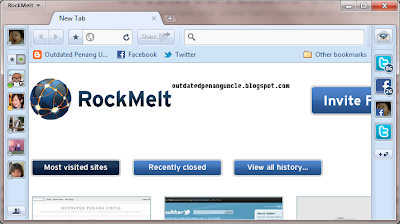 I have blogged about RockMelt few days ago. And on that very same day I have already got it installed. So here is some snapshot, and some rant on this beta. Usually when we read news papers or magazine, the models/artists in the articles or ads are super beautiful, not a flaw! Many years back it was make up, so you still can see a little bit of flaw. But now with photoshop, there is no flow, except sometime the "photoshoper" that made some mistake. :P With photoshop,the guys can be macho! This video showing how the people in video/movie can be taller or slimmer or more macho, any way you like it! How good is Yahoo Answers? Anyway, sometimes I got google to show me some yahoo! answer or some other forums. But how reliable of these yahoo! answer and forums? 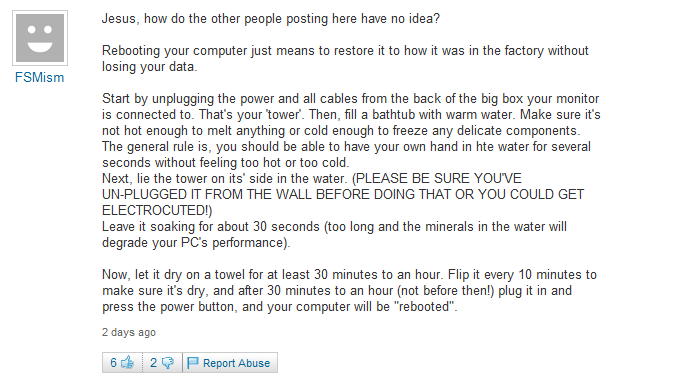 See example here, the questions was "Can i get help rebooting my computer?" There are some buzz on the WWW on new browser these few days. A new type of browser called "RockMelt" has came out. It has the Google Chrome look, but with Facebook, and Twitter and some other social media "built" into the browser. 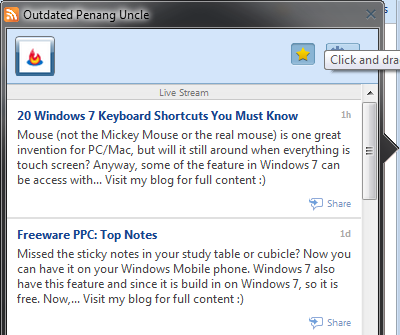 Couple of months ago, I still using some counter websites to track who/where/how my audience that come to this Outdated Penang Uncle blog. So I have to sign up for the service (yes, a lot of them are free), add the widget and after a while login to find out the statistic. For past few months, blogger added the page view tracking for all the blogspot, so even though I still have the counter at my blog, usually I just look at the "Stats" to find out my audience. 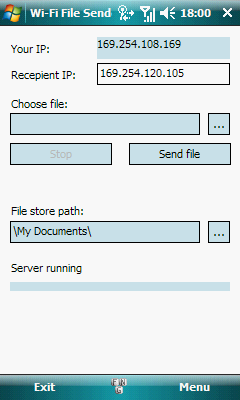 Tiny program for files transfer via WiFi. 1. You have to connect two devices via WiFi. 2. Run program on both devices. On first device fill "Recepient IP" (IP from "Your IP" on second device). 3. On second device set directory for files store. 4. On first device choose file and click "Send file". Although people start to forgot what WinMo is like, but there are still a lot of good people there writing some amazing apps for WinMo, example WinStart. Written by a member of XDA, it is to replace Start Menu on all of WinMo6. * (6.0 ~ 6.5.3). See how smartphone users see each other. Too bad Windows Mobile not being mentioned here, people just forgotten it huh. Happy Deepavali to all my friends who are celebration it! This is festive of light right? Happy holiday to Malaysian and Singaporean (India maybe? Not sure other country have holiday or not). I will try to write something on this long weekend...... but usually not. :P Check back next week then. Some guy caught on camera was reading a book, using a Kindle and taking to phone. Super effective with multitasking or super dangerous? Are you cheap labor? Or you are as expensive as your company's CEO based on the hours your work? Use this software to calculate for you. I have talked about how to disable auto-maximize snap feature in Windows 7 yesterday, today I am going to show you how to make the keyboard easier to use in Windows 7. You might have notice when dragging windows in Windows 7, you can see the windows suddenly 'snap' and maximized if you drag the windows close enough to the edge of the screen. Some find it useful, but not for me. So after some googling, here is what you can do to disable it. There are methods available on internet on how to download youtube video, but how about TED videos? What is TED by the way? Click here. XDA-Developers has its first sister site: iphone-developers.com. I thought it was to hit some monkey game, but actually it is some memory game. If you have friends or co-workers that always ask questions that the answers always available on google, here is the thing to shut their mouth forever, HAHAHAHA. You might have noticed that recently I have added a new widget on this blog. It is called "You might also like" widget. Today I got an email in my Gmail spam box with sender name "Maybank" (one of the online banking I use) and title "You have 1 new security alert". Sender with this email "jamfiddl@aol.com". I know what is a phishing email, but out of curiosity, I went to click on the link. Nowadays everyone should already have at least an email account, facebook/twitter account, online banking account, blogger account, and many more online accounts. What happen if someone pass away suddenly without leaving the traces of login name and password for these account? It would take months or years to get the online companies to believe that you are the beneficial of the deceased. Some accounts you might want to notify the readers immediately, but how do you do it without the deceased's password? No one would like their family members to suffer even more when they found out they cannot do anything with the deceased online accounts! "PDFTiger is a Word To PDF Converter and PDF To Word Doc Tool that quickly and accurately create PDF documents from Word, Excel, Powerpoint, txt or Images. PDFTiger can also convert PDF files into editable MS Word Documents, Rich Text Documents, Plain Text Files, Images, HTML Files, and Shockwave Flash SWF Files. " For limited time (until Oct 21, 2010), you can register it for free! After that you have to pay US$39.95! 4. Start converting from or to PDF! GIMP is always my choice of software to edit photos or pictures, because it is free! Although not 100% comparable to Photoshop, it wins because it is free. Adobe Photoshop CS5 is now selling at US$699 at Adobe website. That is very ka-ching!!! Mark Zuckerberg is the founder and CEO of Facebook . He was worth $1.5 billion on year 2008 (#785 on Forbes list), and now he is now $6.5 billion, #35 on Forbes 400 list! Thanks to you all that plays Facebook games all day long, he is now one of the riches under 30 person in the world! Someone make a video to rap on/by him(? ), hahah, Enjoy! I am a huge fan of Spb Mobile Shell after tried several different UI on my HTC Touch Elfin. Spb Mobile Shell is the only UI that survived until today. I am no longer using HTC TouchFLO, ever! You can also customize the range of 6 numbers it should generate. Meaning if the lottery is 1-42, after you set it on the software, it will generate random (or lucky!) numbers from 1 to 42 for you. Okay, this is not a tutorial to teach you how to get twitter followers actually, my apology. Someone that I added in twitter recently (because he/she followed me first, so I followed him/her back as a polite manner) is promoting a company that provide twitter followers with a price. I have migrated to Windows 7 recently, and was a jump straight from Windows XP, not Vista. It is not really a struggling process for me because of a lot of different between Windows XP and Windows 7, because I am OutdatedPenangUncle! Another phone from HTC. Almost same like HTC Desire HD, but with hardware keyboard. I have been using this Task Manager on my HTC Touch for a while, and it perform up to my expectation compare to other Task Manager. Now with version 2.0 with more improvement, I am going to update this apps on my HTC Touch tonight! I have been using version 1.8. For HTC or HTC Sense UI fans out there, now you can have it on your desktop/PC/laptop. You can run it on WinXP and Win7. Here is the print screen of it. Basically it has the time, date and weather only. 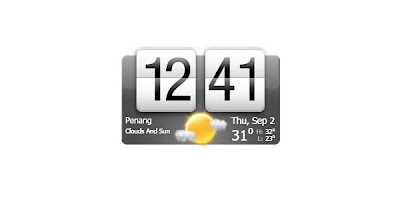 The time and date are based on your PC/laptop, but the weather is from either Accuweather or MSN. So internet connection is needed to have the weather update. You can choose weather of which place you want it to show and how often to update it. For Win7 , you can right away use the 2.0. I tried the 2.0 version but it require .NET framework 4.0 on my WinXP. I tried to install .NET 4.0, but having problem to install it on my WinXP SP3. Version 1.1 works for my WinXP SP3. What do you think about the video? NICE! Only 6.8M, very small setup file! Available for windows and linux. You thought that all the inventors have to be old man and has hair style of Einstein? Look again, check out the list of innovations by young inventors under 35 years old! For the record, Sesame Street is the longest running children show in US. Today I came across 2 more video showing awful things that people can do to iPad . One to shoot it, yes shoot with a gun. Another one to blend it, excuse me? blend it? YES, see the second video. MV by a French. I don't know what he sings, but you can see familiar stuffs like iPhone, PS, and Social networking, especially "add as friends", and "poke me". BlackBerry 6 is out today! Major GUI improvement, and support multi-touch. Want to get one? How fast is your iPhone? iPhone 2G/3G/3GS/4 Speed Comparison from Mike Hellers on Vimeo. It's real. I have tried it on my laptop using Sun VirtualBox . You can also burn the iso on CD or make a bootable USB drive. No installation needed, just run the live CD. Which arm is better? Your own arm or ARM processors? See the video by ARM to show that ARM processors are really powerful to resolve Rubik's cube . Mobilism (ppcwarez.org) is back online. Right now only can access it using IP address (Thanks to FuFu for providing it). However it is slow and might not work sometime. Please be patient as the people at mobilism is working hard to bring it back. Update (Jan 05, 2010): It is up now! 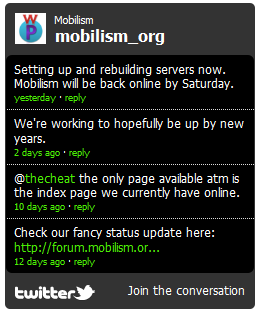 Update (Nov 19, 2010): I haven't login to Mobilism for quite a while, noticed that it was down last week because of hacker's attack. It is back online now, but I have problem to post reply on it, could be my FireFox, or something else. For you all, check it out your self. Windows Phone 7 and XBox360 Live and Kinetic being demo during the keynote at WPC (Microsoft Worldwide Partner Conference, Jul11-15, 2010). I would want both of them! See the video in IE (I tried FireFox , but can't see the video). You may have to allow IE to install silverlight if you don't have it yet on your laptop/PC. Go to 58th minutes for the Windows Phone 7 demo. Go to 75th minutes (1:25) for XBox360 demo.